September 8, 2016 - Upper East Side resident Lawrence McClusky has decided to put his phone away and pleasure himself later this evening instead. McClusky, 32, achieved a powerful erection while searching the internet for US Open results and was primed for a good, strong tug on the ole’ kielbasa flute. He had second thoughts, however, when he realized it was only 4:45 in the afternoon. June 14, 2016 – Sunny the show dog, a seasoned performer now hitting the road with the touring company of Annie, told reporters Tuesday that she can't wait to get totally laid after the matinee performance. February 24, 2016 – Americans woke up Wednesday to find that Facebook had updated their interface to include new versions of “likes” known as “reactions,” which can express a wide range of emotions in response to a status. One sad, lonely American in particular, Garry Masterson of Green Point, Brooklyn, has stated his intention to review his previous decade of Facebook likes, and change them to a more accurate reflection of his feelings at the time. January 6, 2016 - Every American has heard of the board game Monopoly; most have sat around a table for three hours and played it. Well, move over Oriental Avenue, there is a soon-to-be-released even more controversial game that is demanding the nation's attention, as players gleefully shout derogatory epithets at each other in bad German accents. October 28, 2015 - As the nation prepares for its favorite costumed holiday, Queens resident Shawn Goggins finds himself in a moral quandary: should he or should he not wear blackface? After his plans to dress as a Lamar Odom zombie were nixed by Odom's recent recovery, Goggins is considering simply going as Odom in his prime. "As far as I'm concerned, I'd just be switching green face-paint for brown." September 15, 2015 – Sources have confirmed that, over the weekend, legendary kaiju monster and regular Times Square patron Godzilla was brutally assaulted by military forces on 44th Street, despite the fact that, as he later told reporters, he was only visiting to catch a Broadway show, and possibly do a little shopping on the side. August 26, 2015 - Newly arriving first grader Aiden Montblanc, at Manhattan’s Upper East Side elite private elementary school St. Benedictus Prep, is refusing to read an acclaimed children’s story, Dr. Seuss’s Hop on Pop. The book is part of all first grade English curriculum, and is read in every class at the Christian school, which is known to pump out many of America’s most intellectual middle schoolers. August 13, 2015 - When friends of local resident David Smacken heard tales of his dating life, they quickly noticed a suspicious pattern regarding all of his breakups. "He always said something like, 'Oh, she's crazy,' or, 'She's a mental patient'," longtime friend Darrius Williams told the press. "And he said it enough times that we wrote it off as an easy excuse. We'd never have called him on it, but we were always skeptical." June 22, 2015 - Harlem resident Dante Chapman is described by friends and family as “emotionally demonstrative as a German U-Boat.” Yet on Friday evening, the 42-year-old father of three was found openly weeping and rolling around in a fetal position during a 7:30 screening of Pixar’s latest film, Inside Out. Though disturbing to many patrons, and hilarious in the eyes of an unsupervised group of seven-year-old boys, none of this came as a surprise to Chapman’s wife Louisa. February 4, 2015 – It was reported last night from the Caffe Bene on Riverside Drive that confirmed human female, Genevieve “Jenny” Bello of Washington Heights, has been formally labeled 'quirky' by several male friends and admirers, due primarily to the pleasure she derives from the natural act of food consumption. January 15, 2015 – Following a successful run at Seattle's 5th Avenue Theatre, J. Augustine Truffle's original production of White People Problems: the Musical will premiere on Broadway at the Winter Garden theater in April, producers announced Thursday. The show, which drew significant praise from the vast majority of Seattle residents, will join the pantheon of theatrical productions celebrating the profound struggles of upper-middle class American life. December 5, 2014 – The performance careers of Samantha Giblet, 27, and Parker Sachs, 25, have enjoyed stable trade relations for over a year, wherein both parties attend the other's improv shows, no matter how expensive or inconveniently timed. That stability has been under threat since last Saturday, when Parker missed Samantha's performance at the Upright Citizens Brigade's Indie Cage Match. September 18, 2014 – With detailed threats made by the terrorist group ISIS against midtown Manhattan and other major city centers, police and federal officers are doubling down on security in all of these key locales. In the case of Times Square, the major focus of the group's social media attention, NYPD Commissioner William Bratton has stepped up, assuring residents and visitors that law enforcement would do everything in their power to safeguard the trash-covered streets, unlicensed entertainers, and tacky billboards which stand as symbols of everlasting freedom in our great nation. September 12, 2014 – While traversing Gracie Mansion early Friday morning for a pre-breakfast snack, New York City Mayor Bill de Blasio came across a room he had not yet entered and heard muffled sounds within. Upon opening the door, he discovered that it contained all of the drug addicts, pushers and prostitutes of Times Square's fabled past century, having been captured and locked away by former mayor Rudy Giuliani. July 30, 2014 – The Mommy Wars, a battle for maternal moral high ground which has raged since the mid-80s, has seen a recent explosion of conflict in the Brooklyn region, culminating with Wednesday's news of working mom ground troops crossing the border into Bushwick. Early reports suggest that, despite their greater resources, ground troops are facing heavy stay-at-home resistance. 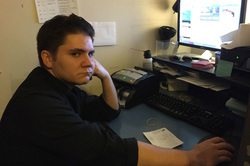 July 4, 2014 - When Raymond Kickery, a 28-year-old produce manager from Kent County, Rhode Island, purchased a hot dog from a vendor on 44th & 8th in New York City, the traveler was shocked to learn that, despite being absolutely certain he had paid only two dollars for a hot dog in the past, this one was going to cost him three. May 27, 2014 - Marisa Taylor, an Australian tourist outside the M&M store in midtown Manhattan, having recently been offered a free compact disk containing amateur hip-hop music, is becoming increasingly suspicious that the man offering the CD may request some form of compensation.